Got this for a football game i was attending with family. everyone was impressed with the seat and had to try it out ......all responses were NICE SEAT. I got the green one to stand out.......it did. It's everything it said it would be. Recommend highly! This is my second purchase of the same chairs. My first set were stollen out of my car along with a some other things. That should give you an idea of how good these are... I have purchased a set twice because they are awesome! You will love the seat! You've just gotta check this out. Oh WOW, I was tickled to find this kind of seat. I love it and of course the color!!!RED. PERFECT!!! The seat Is really comfortable. Unfortunately I haven't used it yet, just because All the games have been out of town. I've sat it at home and it is so comfortable. This is an excellent stadium seat. It is very comfortable, and I think having the arm rests adds to the comfort. It clicks into position easily and also easily folds out flat to carry. I am a senior citizen and can comfortably carry it on my back. I have had many compliments on it from the fans around me. Several parents and grandparents on the hard bleachers have asked me where I found it. I happily share my discovery of Grommet! I ordered one of these each for my husband and me to watch our son play ice hockey. He was dubious initially... Not at all "hockey dad" to sit on a cushioned chair! 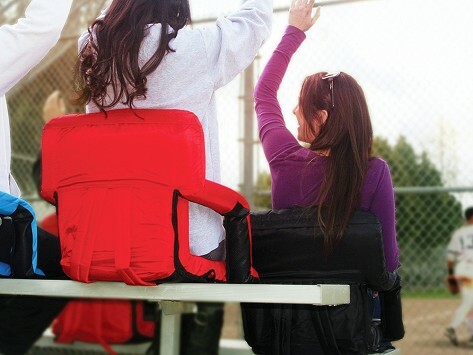 First time out, we realized that having back support was great, and not having direct contact between your bum and the artic bleachers is even better. Other hockey parents are covetous, and hopefully, we'll drum up some more commerce for you. 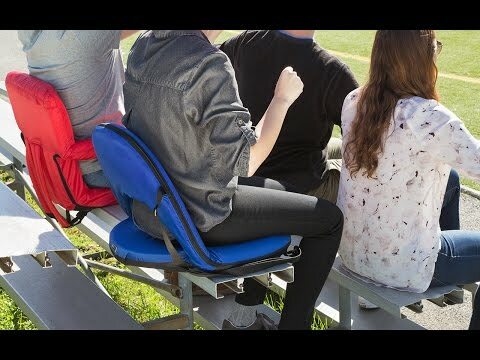 Bought this for watching my son's high school soccer games where the bleachers leave a lot to be desired. It's comfortable and I love the adjustability. I like the backpack style straps for carrying. Areas for improvement would be if the bottom was more waterproof (the bleachers are always wet!) and it would be awesome if there was some way to attach an umbrella like with regular chairs.